Bloodstained: Ritual of the Night for the Nintendo Switch made an appearance at PAX East this year, and people were disappointed to discover the game's performance seemingly isn't up to snuff. Here's an interesting twist, though: The latest PC build of the game was also available for the press to check out (and under embargo), and it ran better than the Switch build. Much better. I played the Switch build of Bloodstained for myself at PAX East and was terribly let-down by bad input lag, dismal frame rates, and frequent slowdown. I later talked to 505 Games and was assured Bloodstained for the Switch will be optimized by the time the game arrives in summer of this year. Playing the PC demo at the event gave me an idea of how Bloodstained's creator, Koji Igarashi, intends for the game to look and move. 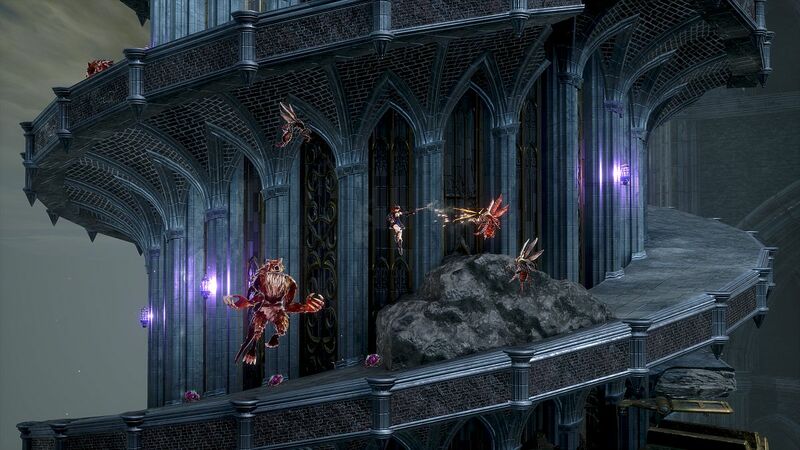 Though the Switch build is (currently) a stuttering mess, the PC build offers something closer to the Castlevania: Symphony of the Night experience we're all hoping for. Whereas Bloodstained's Switch demo put us on a galleon traversing rough seas near the game's opening, the PC demo had us climbing a crumbling tower laced with rusty clockwork gears (of course). In true "IGAvania" fashion, it's not a straight climb to the top: You need to duck into doorways and travel through monster-infested corridors that take you on detours around debris and gaps. Defeating monsters sometimes earns you a "Shard," which infuses you with an enemy skill that you can turn against your foes. Think, like the monster souls Soma can collect in Castlevania: Aria of Sorrow. Turns out I needed every bit of help afforded to me when I reached the boss of the tower, a slavering two-headed dragon with a seemingly infinite pool of hit points. Unfortunately, I couldn't beat the beast. The 505 representatives showing off the demo said it's possible, but I burned through my store of health potions without much luck. I might've been under-leveled, or the dragon might've had its hit points bumped up to keep us from advancing too far beyond its lofty lair. I'm hoping the final build tightens up the fight, since it was sometimes hard to get a handle on protagonist Miriam's own hit box. Sometimes she just wound up immobile under one of the dragons' heads despite me paying close attention to the monster's cues. That said, it was cool to watch the dragons' heads work in tandem to execute killer attacks. I was also happy to see the demo moved at a stable 60 FPS. If there were frame drops, I didn't notice them. Despite my hard time with Bloodstained's dragon boss, I did enjoy my ascent up the tower. Moving around as Miriam feels good, as does attacking enemies with the armory the demo supplied me with (I wound up favoring a pike) and utilizing enemy skills when things got hairy. Miriam is a bit "floaty," but that's probably by design; she moves a lot like Symphony of the Night's Alucard, and both characters have supernatural qualities to them. Incidentally, I brought my PS Vita (it still means life to me) to PAX, which is equipped with Symphony of the Night. After a "side-by-side" comparison, I determined Miriam does indeed have a lot in common with the dhampir anti-hero. I still can't say if Bloodstained will run at a steady 60 FPS on the Switch, or if it'll even manage a consistent 30 FPS. But the PC demo provided me with proof that at least one platform should see a solid successor to Igarashi's Castlevania legacy. We'll see what's what when Bloodstained: Ritual of the Night comes to PlayStation 4, Xbox One, Switch, and PC this summer. Tagged with 505 Games,	Action Adventure,	Koji Igarashi,	Opinions,	PAX East 2019,	PC,	Switch,	WayForward Technologies.